A range of general purpose operational amplifiers from Texas Instruments suitable for a multitude of uses. These devices offer cost-effective performance in non-specialised applications and are available in single, dual and quad configurations. The range includes a large variety of both through hole and SMT packages. 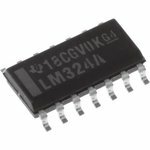 Many of the devices in the LM family of op-amps offer low power consumption and are able to operate with single supplies with input common mode voltages that includes ground.